To those who know me well and the way I food around, then you should know that my Missie’s Pud Inn (aka #MissiesPudInn) wouldn’t be Missie-licious enough if we didn’t involve Sheffield and the word food in the same sentence. I can finally reveal the five puddings we’ll be serving to the lucky diners attending our PudInn Club TODAY. 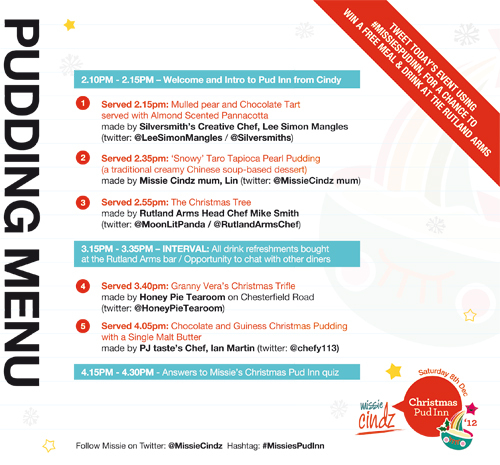 Our five talented and generous Chefs and bakers have been busy cooking up a festive-themed pudding course menu – a big thank you to the Silversmith’s Creative Head Chef Lee Simon Mangles, my mum, Lin (who in my eyes is Pudding Queen! ), PJ taste’s Head Chef Ian Martin, Honey Pie Tearoom and finally, the Rutland Arms ‘Pudding Panda’ Chef Mike. Have you also read our Twitter Pud Inn Competition with the Rutland Arms for today? For details, see this blog post: Tis the Season to Give Puds for your chance to WIN a complimentary hearty meal and drink for your sweet tweetings!